Possessing a truly laudable ardor for art collection, Anil Relia refers to his approach and process of collecting Indian portraits as an act of ‘selection’ rather than ‘collection’. He begun his collecting expedition almost forty years ago by purchasing works of his teachers, and students. Today, Anil Relia owns thousands of artworks comprising not only of contemporary and modern art, but also works that date back to the 16th century. Recognizing the artworks for its historic value, Anil Relia’s collection is an amalgamation of both personal choice and artistic significance. With his extensive collection that he regularly exhibits in private and public museums in Ahmedabad, Anil Relia shares with Larry’s List his motivation towards launching an Indian Portrait Museum and his insights on collecting portraits. 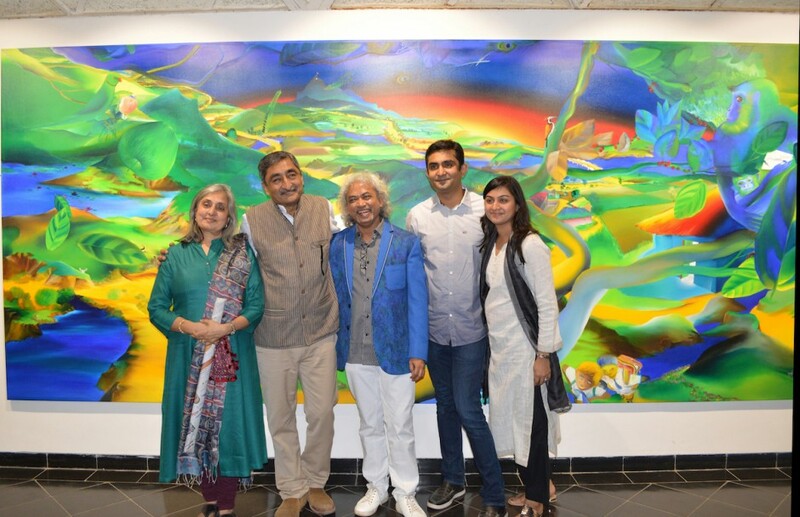 Anil Relia and family with artist Nabibakhsh Mansoori (centre) from a recent exhibition of the artist, 2016. Courtesy of Anil Relia. What made you start collecting contemporary art? There are two phases in my life, which mainly prompted me to start collecting art, one is while studying at Faculty of Fine Arts, M S University, Baroda, where I was really impressed by the works of our teachers and would buy their graphics from our annual art exhibition. I would also collect works of fellow students which I found appealing. After graduation, I got busy with my commercial printing work until I realigned my focus and started a graphic studio. 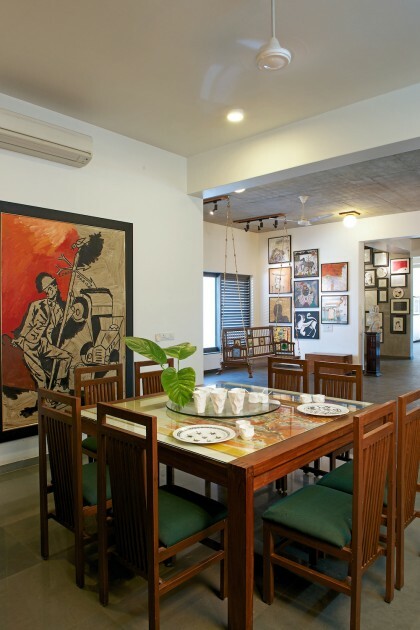 At the studio, I worked closely with many artists, namely M. F. Husain, S. H. Raza, K. G. Subramanyan, Amit Amabalal, Jyoti Bhatt, Jogen Chowdhury, Manu and Madhvi Parekh, and in turn, developed personal relations with them, and they would come and stay with me and my family. During this phase, my interest in contemporary art was awakened one more time and I started collecting works of these artists. Many a time, I would barter the paintings of these artists in lieu of their work done in my studio. To me, it never felt like I was building a collection of artworks — it was merely a collection of memories of my friends. At first when I was collecting art, I really did not have any motivation or focus. I would acquire anything that appealed to me. Suddenly, I started to notice that many artworks in my collection were portraits, be it miniatures, oils or photographs. I also realized that I had an unspoken fascination towards portraits, specially works that were so beautifully created only to be discarded and sold through scrap dealers. After that, I diverted my focus to the subject of Indian portraits. Many countries have portrait museums which house some of the best-done portraits from around the world, and given India’s rich heritage, we also need something like that. 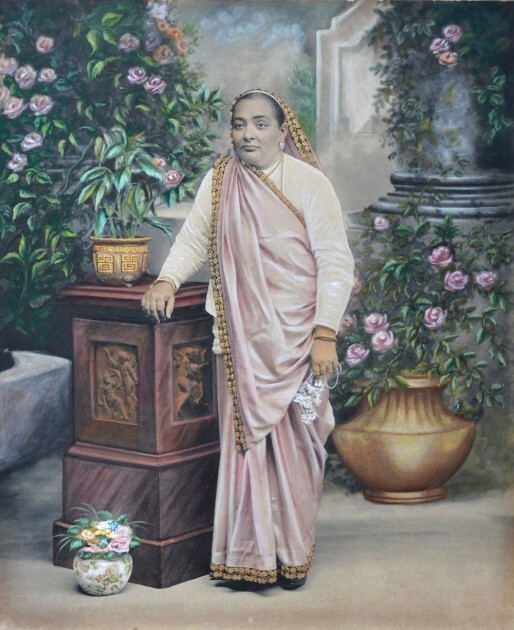 So now my main motivation is to collect portraits and eventually have a museum dedicated to Indian portraits. I would call this a selection, rather than collection, be it modern, contemporary or the miniatures. What is your focus regarding the artists in your collection? Are you interested in emerging or renowned artist? Both have always interested me. Personally, understanding the artist’s work, their thinking process and its implementation is very important. I purchased my first artwork almost 40 years ago while I was studying at Faculty of Fine Arts, M S University, Baroda. There was an exhibition held at the gallery in our college where our teachers had presented their works. One of the works of Bhupen Khakhar on the subject of ‘Abstract Walls’ really stood out to me, and I wished to purchase it. Although that painting was expensive for me then, he happily agreed to give it to me at a reasonable price and to let me pay in instalments for a year. That was my first purchase, I took it and hung it on a wall of my hostel room. I have thousands of artworks in my collection, dating from 16th century miniature paintings all the way up to contemporary & modern art. These includes oils which are over 10feet high to carte de visite which are only up to 2 inches wide. I always wanted to enjoy and live with the artworks that I own. My house has been specially designed and built to make this possible, it is like my own personal museum. Out of my entire collection, about 250-300 artworks are always on display in my house. I regularly keep changing the display. 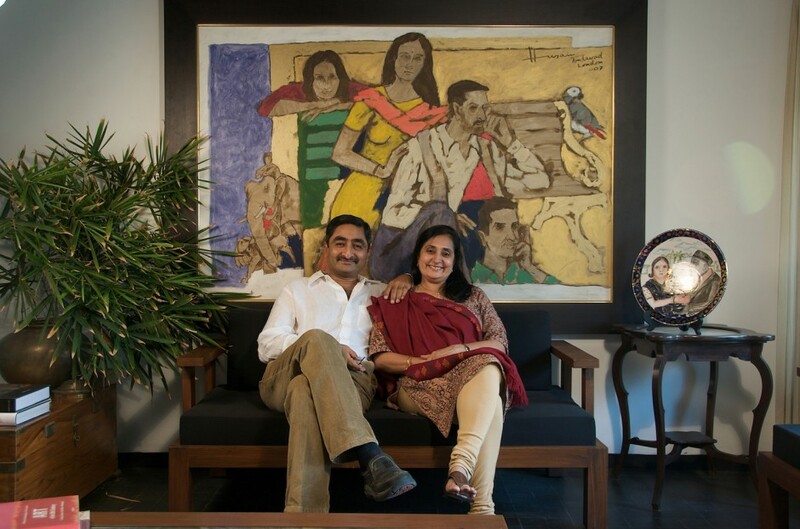 Anil’s art collection at home. Courtesy of Anil Relia. 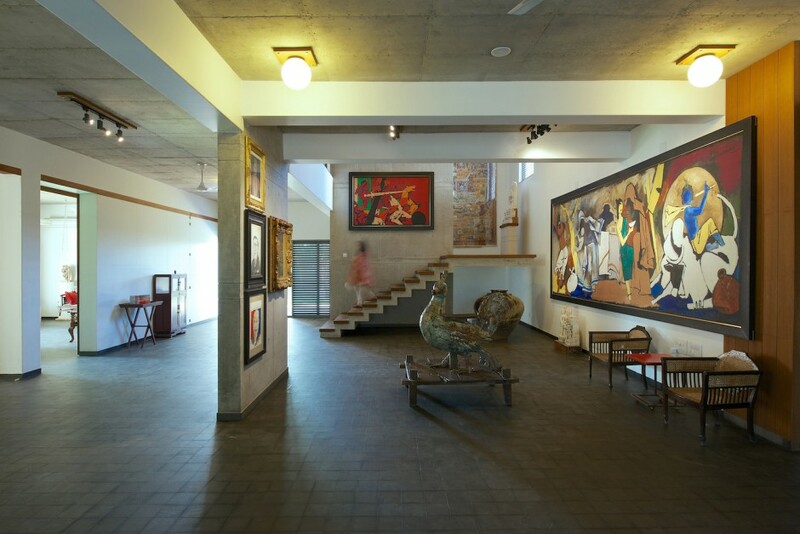 I regularly have exhibitions from my collection here at the Husain museum in Ahmedabad. I usually have at least 1-2 exhibitions here annually. Apart from this, I have loaned several works from my collection for exhibitions held in private as well as public museums. Is there any kind of artwork that can make you write a cheque without any consideration? Being a portrait collector, I always liked to collect portraits done by different artists. M. F. Husain, one of India’s topmost modern artist, was a good friend of mine. Over the years, he had developed homely relations with my family. I had requested him to make my family portrait, for which he readily agreed and did so. Upon completion, looking at our relation and my love for portraits, he gifted the portrait to me. This is one such painting in my collection for which I would have written a cheque without any consideration. Anil Relia and Tanuja Relia. Courtesy of Anil Relia. The family portrait of Sir Chinubhai Baronet is the largest portrait in my collection and also my most treasured artwork, not just because of the painting, but also its historic value. There are nine family members painted in life size by Fyzee Rahamin in 1910. Fyzee Rahamin was the court painter for Saiyaji Rao Gaekwad of Baroda, and after India’s partition, he moved to newly created Pakistan. Sir Chinubhai Madhowlal Ranchhodlal, pioneer in establishing textile mills in Ahmedabad, was known for his charitable and social dedications. He was given the tittle ‘Baronet‘ and also awarded with ‘C. I. E.’ (Companion of the Order of the Indian Empire) by the British government. He was the first local resident to become the Mayor of Ahmedabad Municipal Committee. I also had the honor of meeting in person one of the family members who was painted, she was in her 90s when I met her. 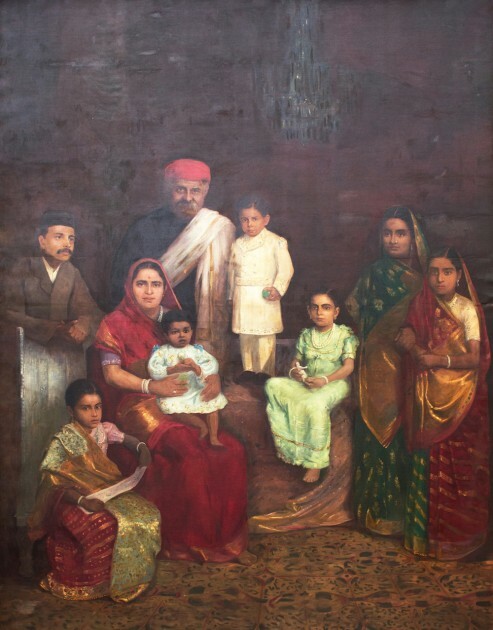 Family portrait of Sir Chinubhai Baronet, by S. Fyzee-Rahamin, 1910 CE. Courtesy of Anil Relia. Many a time, I come across very beautiful portraits. But to my disappointment, the seller has no idea as to whom the sitter or the artist is. Even if I mange to get information about the sitter and approach the family of the sitter, who is probably the 4th or 5th generation, for more details; it is surprising to know that the family members also do not have any information about them. It is sad to know that due to lack of documentation, such important pieces end up in scrap and eventually in my collection. Lot of times I come to know that the sitter in the portraits is from a princely state, or sometimes a wealthy trader and philanthropist who has lived an extremely luxurious life. It saddens me even more when I come to know that the family members are selling the portrait of their forefathers just because they are in need of money. Majority of my portrait collection contains artworks which are done over a century or more ago. But when it comes to modern and contemporary art, I personally feel it is very important to meet the artist and even discuss the artwork. I have some artworks in my collection which I have commissioned. 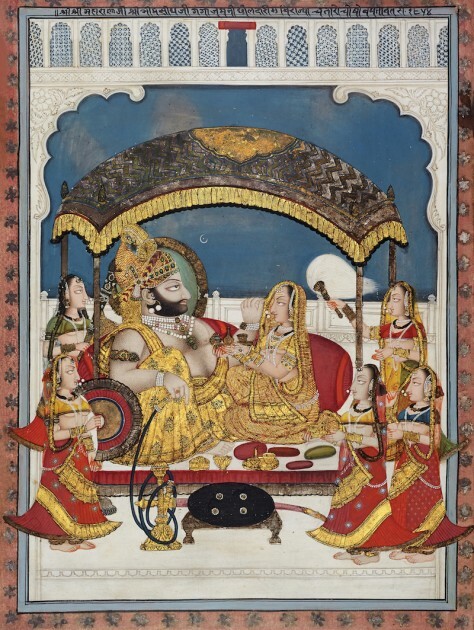 Maharana Bhim Singh of Mewar seated under a Ganga-Jamani canopy – by Choka, dated 1798 CE. Courtesy of Anil Relia. Do you rely on art advisors, or how do you make your decisions concerning purchases? No, I solely take the decision of what goes in my collection. Once the artwork appeals to me, I check to see if there is a missing link in my collection. If found, I work on acquiring it. Every new addition to my collection is a happy moment for me. What are your advices to young and fresh collectors? Always collect what you like. The artwork you select should feel like it is was made for you and should merge with your life. Never try to follow others, and enjoy the art that you own. Your collection is meant to be enjoyed and not stored away in boxes. Portrait of noted Indian actor, Dilip Kumar, by M.F. Husain, 1995. Courtesy of Anil Relia. When I travel to different places around the world and visit the portrait museums/galleries, I am filled with an inspiration of opening my own portrait museum in India someday. Fakes and the people involved around it. Can you name three emerging artists, which should be on our watchlist? I know many talented and promising artists. Some of the local artists whose works I personally enjoy are Nabibakhsh Mansoori, Bhairavi Modi, and Neena Singh. What are you especially excited in regard to art in the next 12 months? Currently, I am in the process of curating the next series of my portrait exhibition from my collection. Most of my time is spent on the research and selection of the artwork. This will be the 9th exhibition in the portrait series and is focused on Parsi portraits. The Parsis, whose name means “Persians”, are descended from Persian Zoroastrians who emigrated to India, in the 8th century, to avoid religious persecution by the Muslims. This exhibition will contain paintings, photographs, graphics and collectibles relating to the Parsi community of India. I am really excited about this as the subject is very unique. Parsi Lady painted photography by The Bombay Photo Co, circa 1930. Courtesy of Anil Relia. What is your motivation behind opening a museum / public accessible space? When I talk about opening an Indian portrait museum, my focus is not on just the painting or picture of the person. For me a portrait tells you a lot more about that person, their life, their clothing, the décor and architecture around them, their society, fairs and festivals and even their day-to-day life. I would like others also to experience the same feeling. It is like taking a trip back in time to the period of the painting. Where would you like to open the museum and why? I would like to open a museum but location and other details are still not decided. There are more and more private museums developing. Is it today necessary to have a private museum? Such as to get the best artworks? Museums in general are necessary. Museums reflect the culture of the people, their thoughts and their liking. Yes, private museums are definitely a good idea as they are much easier to work with. But that being said even public museums sometimes do a good job at bringing good exhibitions. Disaster of Hiroshima by M. F. Husain, 1998 CE. Courtesy of Anil Relia.